It is a relative fact that for you to move forward in life, sometimes you have to take a step backwards. That way, you can ascertain your heritage, as well as define who you are more intuitively. 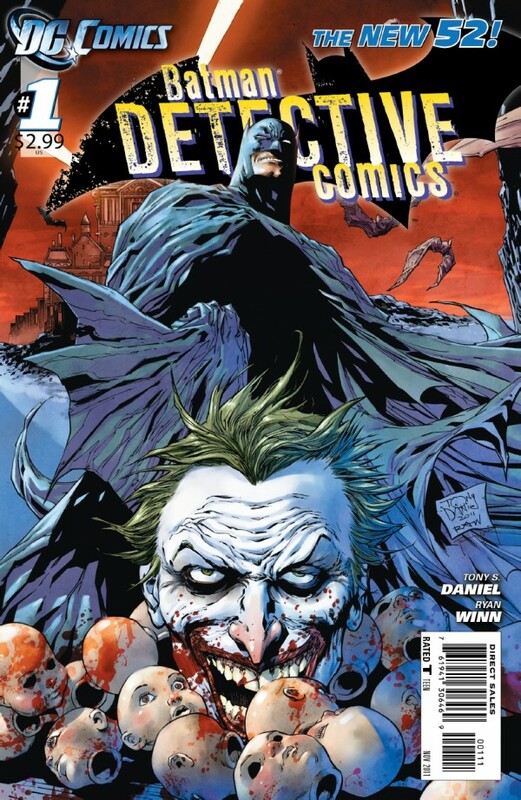 Moreover, the strange thing is, is that this is precisely what this rebooted issue of Detective Comics does, one Written and Drawn by Tony Daniel; and Published by DC Comics in September 2011. One dark and gloomy night, Bruce (Batman) Wayne encounters the mad serial killer, the Joker, on two separate occasions. Now the first time that this transpires is when Batman attempts to halt this white-skinned lunatic’s macabre rampage within a derelicts building situated in Gotham City. Regrettably, though, his actions’ are halted – initially because he has to save a young girls life, Olivia Carr – and subsequently due to the overzealous actions of the G.C.P.D. Thankfully, the second time Batman and the Joker meet, the Caped Crusader does fare a little better. Because after liaising with Alfred and Commissioner Gordon on matters of a differentiating nature, Batman nabs this pasty faced git, and thrusts him into the hands of Jeremiah Arkham in Arkham Asylum. However, sometime later, the shadowy figure known as the Dollmaster helps the Joker get a new face. So this is the number one that nobody wanted – Detective Comics – the series that started this great publishing house (DC Comics, just in case you were wondering) on the road to what-ever-the-hell they are doing now. However, before I give you my 411 on this number one, there are a couple of points that need to be said first. (1) In essence, this issue feels like a re-imagination of a ‘year one’ type Batman tale, and encapsulates a more dark-rooted Batman in the same vein as Frank Millers ‘Year One’. (2) Conceptually, the overall narrative of this Joker story is strange one in the telling, as the viewpoints are focused primarily on a ‘Batman story’, but in places dwindles between Commissioner Gordon and the Jokers viewpoint. (3) This DCnU Batman seems very simple aesthetically and in nature, and has a very benign and single faceted feel to him. (4) I take it that he G.C.P.D. is against Batman now. Tonally, this point it unclear within this issue, even if it is insinuated that the Mayor is somehow behind this development. And (5) Is Alfred Pennyworth a hologram now? Fair dues, this facet could be a bit presumptuous on my behalf – but, unfortunately, this point was not very clear in the telling also. OK, so now that I have gotten all of that off of my chest – what do I think about this DCnU Detective Comics? Hmm? It is completely sh*t! Overall, it was not the best comic book that I have ever read, but at the same time is far from being the worst. Personally speaking, I did not mind this ‘reboot’ all that much, as it did feel very fresh in a peculiar sort of way. Firstly, the art by Tony Daniel was very nice to look at – though it was uneven and ridged in places. Secondly, it did lay out a basic framework for this title – noir in tone, and ‘Miller’ in subtext. Thirdly, the ‘new-ness’ (for use of a better word) has been conveyed – but in places not so clear. And fourthly, the logo is very nice too – and reminded me in of the seventies Detective Comics logo (See picture). Overall, this number one was not really a number one (if you get my drift) because I did like it due to its freshness. Still, will this freshness be able to maintain it’s... err... fresh-thing-a-mi-jig? Or will it just be another take on a long line of ‘another takes’? Hmm? Time will tell, huh? A fine retro-take on a tried and tested Bat-formula – still promising though.